"In other words, the outcome is not as important as participating in the process. It is the act of being involved that is the greatest victory of all; pushing beyond our personal boundaries, reaching outside our comfort zone, striving to do our best. The results become the “icing on the cake” for our personal journey along the way. It is this same message that is at the heart of Zentangle, the outcome is not as important as the process. It is the journey each one of us takes one stroke at a time, every time we take our pen and put it to paper. What better way to honor the heart of both endeavors than to have an Olympic inspired Diva Challenge less than a month away from the 2012 Olympic Games in London?" When I first saw the challenge with the above I didn't dream of taking part, even less so when I started looking at the entries submitted. 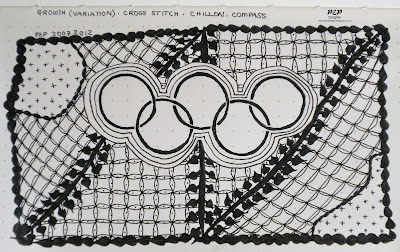 But, a seed had lodged itself in my mind & I wanted to see how the Olympic logo's rings intertwined & started deconstructing them with pencil & paper. Once I'd worked out how to replicate the logo I combined it with a "Z" string (the basis for a little task I'm involved with on the Chocolate Baroque Forum) in my Rhodia Notebook. Working in my notebook is itself a milestone for me as I'm actually working IN my book not just looking at it afraid of making a mistake & spoiling the page. Fear of failure can be very debilitating but unless one tries one will never know. Secondly, what one person sees as 'failure' may be deemed 'success' by another. Well done on many counts Paula, for entering the Laura Harms challenge, for tangling in your book, and for creating such a fabulous design. I like the balance that you have created across your design with the different patterns, and the idea of using Growth to seperate the sections is really clever. Hi Paula, I think your zia is very nice. Plus you have used some tangles I'm not familiar with, which always excites me.I now have to find me one of those rhodia books. I keep looking for paper that has the little dots on it instead of graphic squares. Well done for entering this challenge and for actually putting pen to paper in your new notebook (always daunting starting in a new book). 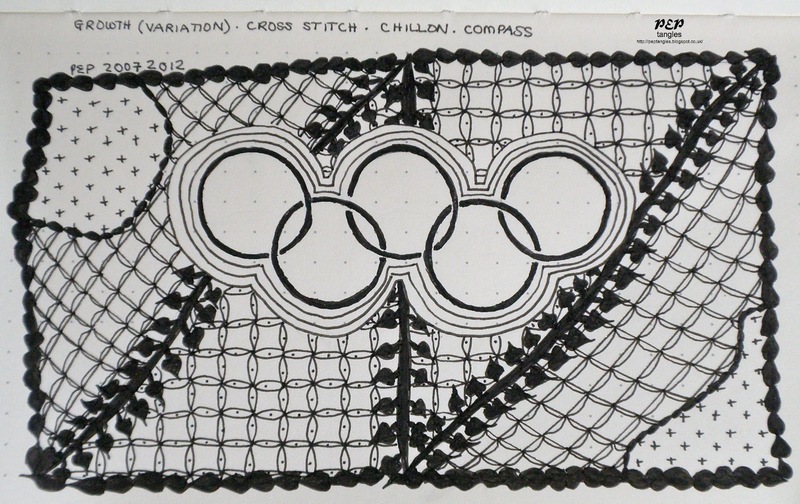 An interesting selection of patterns used around the Olympic rings. Wow, you really are doing well with this Paula. I have to confess I have no desire to have a go at it myself but it doesn't stop me appreciating other's work. It's a beautifully balanced design and very up to the minute using the Olympic Rings. Extra points for taking the plunge in your new book ;D.
There may have been fear but it was ungrounded because your tile turned out well! This is great Paula, I am so pleased that you have started to use your notebook to work in, this is really good. I like the 2 squares with the diagonals as a basic background and the rings are super.